SikUp! is a small utility that offers to do many things, including personal reminder notifications, scheduled tasks, Internet time synchronization, application launching, password recovery and more. It also includes a personal database to organize notes, contacts and passwords with optional encryption. 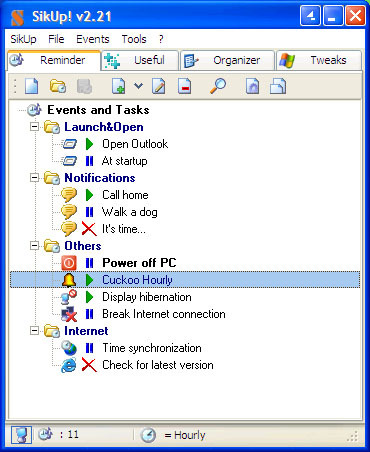 Furthermore, the program includes a variety of common IE and Windows tweaks, as well as an option to create virtual drives, hide existing drives, change the OEM logo and computer access to selected programs. Features are mostly basic but plentiful.